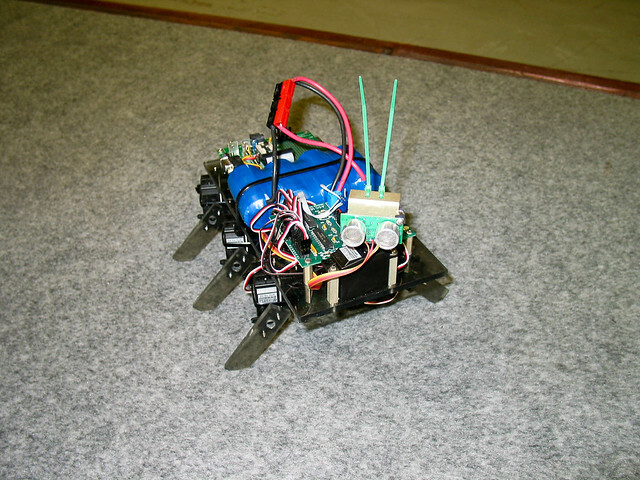 This little guy was the first robot the WSU Robotics Club put together after I joined it (the same bunch of people as, later, built Eddie). Javelin Stamp – an upgraded BASIC Stamp that runs at a blistering rate of over 8,000 Java instructions per second. ASC16 – a dedicated RC servo controller, commanded by serial commands sent to it by the Javelin. And a video of Lobo successfully navigating around a thoroughly daunting obstacle – a cardboard box!